Somewhere, at this very moment, someone is in a grocery store or bakery purchasing muffins. The muffins are baked, packaged and ready to eat. The only effort required of the person is buying them. And 5 minutes to let cool. Of course making homemade muffins takes effort. The question is why bother. Better taste? Healthier ingredients? Saving money? Love of baking? For me it’s about how homemade muffins make me feel. I feel good when I smell the muffins baking in the oven. I feel good biting into them knowing there are healthy ingredients like wheat bran, nuts, orange juice and yogurt inside. I feel good about what I've created. I feel even better when my family enjoys what I've made AND reap the healthy benefits the muffins offer! Not having to throw away excess packaging is a good feeling too! Convenience sometimes trumps effort but no matter how good the muffins are at the grocery store (or bakery), they'll never deliver the kind of excitement or feelings I get from the ones that are freshly baked at home! 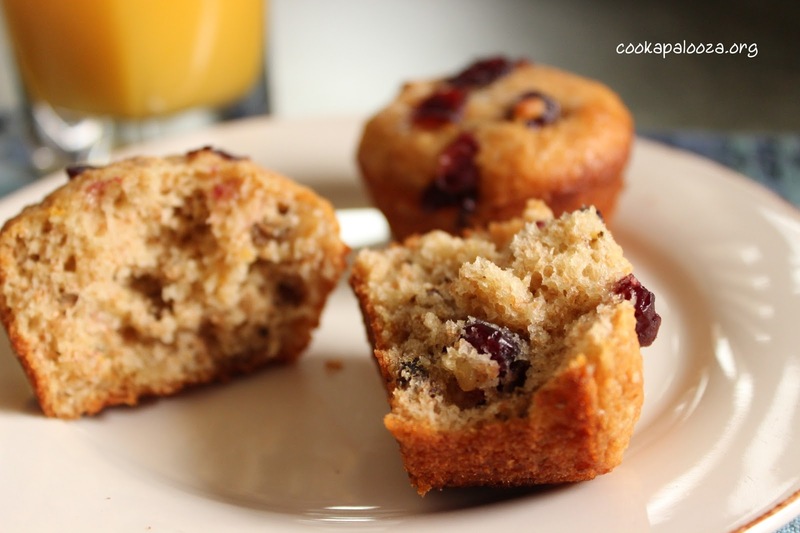 Moist low-fat muffins filled with chopped walnuts and dried sweetened cranberries! 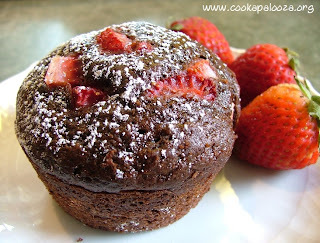 Spray a 12 cup muffin pan with cooking spray. Set aside. In a large bowl, combine flour, wheat bran, sugar, baking powder, baking soda and salt. Stir in 1/4 cup cranberries and walnuts. In a medium bowl, whisk together, egg, yogurt, oil, orange juice and zest. Add to dry ingredients and mix just until moistened. Divide batter evenly among 12 muffin pan cups. Top each with remaining cranberries. Bake in a 375F oven for 18 to 20 minutes or until a toothpick inserted in the center of a muffin comes out clean. Remove muffins from pan and let cool on a wire rack. Ditto on how they make you feel. There's nothing better than waking up on Sunday morning to the smell of fresh-baked muffins. These have every flavor I love, so maybe I'll just have to make them this weekend. Hey Michael, thanks for your comment. Hope you get a chance to make them this weekend! Cheers! btw why this recipe call sot baking soda and powder at the same time??? Using only baking powder will work fine. I use both because it's a habit I got into when I started baking. The benefit of adding baking soda is it helps the muffins to rise and it neutralizes the acids in the juice and yogurt.